Shaun of the Dead and Hot Fuzz are two of the funniest films of the 2000s - perhaps the funniest films of that decade. As far as creative partnerships go, Edgar Wright directing Simon Pegg and Nick Frost as co-leads is one of the most fruitful of modern times. The classic sitcom Spaced - where this partnership has its origins - still stands as the epitome of young, incredibly talented and funny people frolicking in their personal subcultures. So after mainstream Hollywood success for Pegg in the Star Trek and Mission: Impossible and Edgar Wright helming the magnificent Scott Pilgrim vs The World, what could go wrong? If there's such a thing as a sure-fire success, The World's End is it. Here's the concept: five friends return to their home town of Newton Abbot to finally finish the epic pub crawl they attempted as teenagers 20 years before. 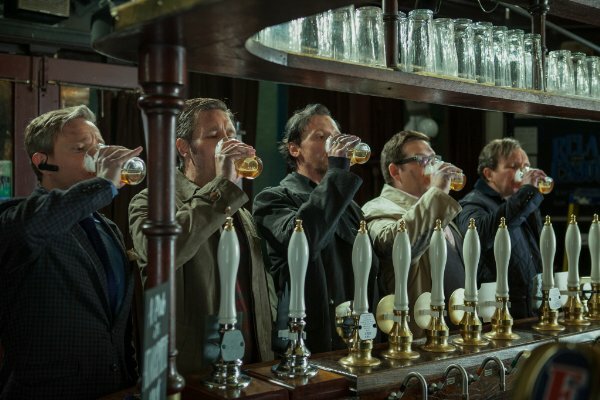 They are Oliver the yuppie (Martin Freeman), Peter the family man (Eddie Marsan), Steven the success (Paddy Considine), Andrew the sensible (Nick Frost) and centrepiece of the film and instigator of this reunion, Gary King (Simon Pegg). These school friends have grown apart and though they remain distant acquaintances, they're only really united in their suspicion of Gary King. King was the cool, party-loving, handsome dude in school, but by middle age has morphed into a depressing, egotistical prick. When the five return to their home town they find that, predictably, everything feels different. When they left 20 years ago they felt like they owned the place, but now no-one even recognises them, much less gives a toss about their return. But this isn't some natural progression of time - more that the entire town has been replaced by robotic doubles from outer space. And so the five battle their way through their home town, locked in conflict with their pasts, desperately trying to survive and complete the pub crawl, which concludes at the ominously named The World's End. The World's End is by far the weakest of the 'Cornetto Trilogy' (which comprises this, Shaun of the Dead and Hot Fuzz), but considering that those two are near perfect, that's not quite the damning criticism it sounds like. It's not that The World's End isn't funny, there are some quite brilliant gags in there. Wright is a masters of physical slapstick; nobody can shoot someone impulsively diving through a window like Edgar Wright; and the impact of someone tripping over and hurting themselves perfectly straddles the thin line between humour and horror. They're also the undisputed kings of comedic subtlety and timing, jokes being invisibly set up in the first act and finally, just when you've forgotten about them, paying off in the third. There's a distinct pleasure in over the top violence that runs through the whole trilogy. the town full of robot people pumped full of censor-friendly blue blood gives Wright license to go full-on Itchy & Scratchy in the fight scenes. Heads are popped off, robots are beaten with their own severed arms and our 'normal bloke' characters punch holes right through the middle of their foes, delivering pithy, ironic one-liners. Though Wright is a naturally comedic director, he's also one of the finest action directors around. Though the fights are chaotic pub brawls, they're always easy to follow. He uses whip-pans and microscopically precise editing to accentuate the force and rhythm of the blows. As an example, note that the camera nearly always travels along in the direction of the strikes. He makes full use of the oub environment, action sequences building to the soundtrack of breaking glass and smashing tables - coupled with the satisfying *KLONK* of bar stools being walloped over robot heads. Hilarity mixed with dynamic action (and a top early 90s indie soundtrack)? This sounds brilliant. 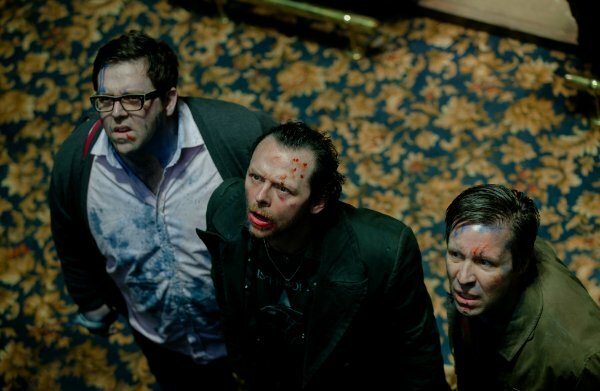 In flashes it is, but The World's End is a deeply flawed film. Part of the problem is the slightly disturbing treatment of women in the film. The only female character of note is Rosamund Pike's Sam - she's barely a character at all. She exists primarily as a sexual prize for Pegg and Considine to fight over, disappearing for practically the entire climax of the film. The other women in the film are literally objectified: transformed into schoolgirl fembots whose only purpose is to exist as faux-Sirens luring our male heroes into their grasp. There aren't many jokes that fall completely flat in the film, but the worst is when Nick Frost's character is confronted by one of these schoolgirls late in the film. She says "I want you inside me". He then tears open a hole in her belly and plunges a hand into her guts. It feels different from the violence in the rest of the film - sadistic and vindictive rather than cartoonish. There's a tinge of violent sexual imagery to the forced penetration that I don't really want to associate with the kind-hearted, innocent roles Nick Frost tends to play. The bigger problems go deep into spoiler territory - so if you haven't seen the film, duck out here. If you have, the review continues below. 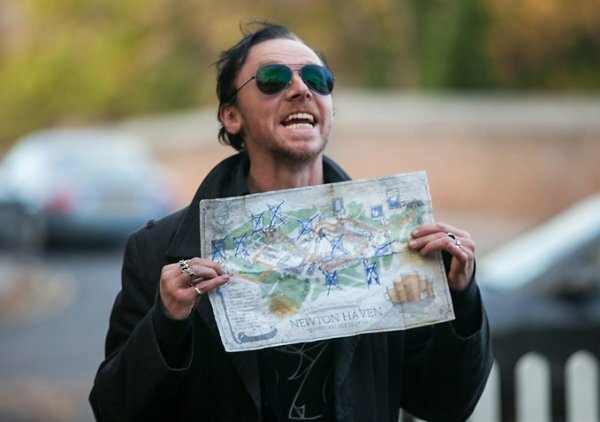 The World's End is on general release now. 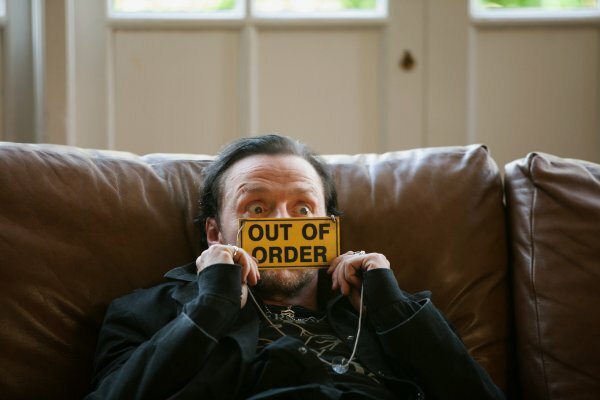 My main problems stem from the character development of Simon Pegg's Gary King, the dramatic centre of the film. Talking about subtext in cinema can be a tricky minefield to negotiate, but this film wears it on its sleeve. Gary King was once 'The King', a boy with the world at his feet - yet like Peter Pan he never grew up. This took its toll - we open the film in some kind of rehab centre, with Gary undergoing some undefined form of group therapy. As he outlines what's happened to his friends we seamlessly edit between their relatively accomplished, normal lives and Gary's - seeing flashes of what looks vaguely like a prison cell. Gary is very much a man with problems. References are made to his past addictions; notably alcohol and heroin. Intimations are made of a dark storm brewing inside him (something Pegg acts the hell out of), and we soon realise that he's taking the completion of the Golden Mile pub crawl far more seriously than is reasonable. In the final scenes we learn that he's recently tried to commit suicide, thus explaining his institutionalisation. I interpreted Gary's obsession with completing the pub crawl as an attempt to revisit the final point in his life when all was happy and optimistic. Upon completing the pub crawl I think he was planning to climb that hill above his home town and slit his wrists. Both Pegg's characters in Shaun of the Dead and Hot Fuzz follow similar (if slightly cheerier ) arcs, all three finding their internal struggles externalised in fantastical situations. Shaun has stagnated as a kind of man-child, and is undergoing the personal apocalypse of being dumped by his girlfriend. So naturally he faces a very real apocalypse full of drooling, comatose, emotionless and passionless zombies. Only by successfully fighting back against numbness and inaction does he become a better person. Nick Angel in Hot Fuzz is a by-the-books conformist who loses his hotshot London career and his girlfriend as a result of being too good a policeman. He sees the error of his ways when he's sent to a village that's model of conformity, yet riddled with corruption and murder. The only way for him to become a rounded human being is to learn the value of chaos and anarchy, engaging in cheesy, fun action cliches. By the end of the film he's a much more pleasant man, laughing and joking with his colleagues. Initially the robot invasion that confronts Gary King seems like a pretty straightforward continuation of these themes. A character who can't let go of his teenage years must literally battle his past demons: bashing a bar stool over the head of his immature childhood and develop into a rounded, mature and reflective adult. In fact the opposite happens. In the climactic events of the film, Gary essentially throws a drunken temper tantrum against a universal parent figure - condemning the entire earth because he doesn't like being told when to go to bed. The consequence of his victory is the complete destruction of technology, hurling society back to the middle ages. Gary never develops in the slightest, the world conforming to his childish 2000AD comic-book warrior fantasy, a ridiculous lone hero accompanied by teenage robot copies of his friends. Everyone is dragged down to his level - forced to eke out their days in medieval squalor - an entire planet forced into Gary's miserable perpetual adolescence. This is the big joke that fuels the entire climax, and it's damn dark: a squealing middle-aged teenager's drunken belligerence resulting in the destruction of civilisation. But any potential laughs are soured by the seriousness with which the rest of the film treats Gary's problems. The script repeatedly underlines the negative impacts of his immaturity: drug addiction, losing friends, losing family, manic depression, suicide attempts and institutionalisation - elements that the movie never, ever jokes about. The about-turn at the end suggests we should have been laughing all along: "isn't it hilarious that this pathetic individual has wasted his life?" Shaun of the Dead and Hot Fuzz are not just great because they're funny and fantastically directed, they're great because we care about the central characters and want them to become better people. For a while The World's End looks like it's heading the same way - I really wanted Gary King to become a better person. Instead he gets worse, and we're all dragged into his hell. I don't demand a happy ending, but the rank odour of cynicism feels alien in an Edgar Wright movie. But most importantly, this final joke isn't funny.